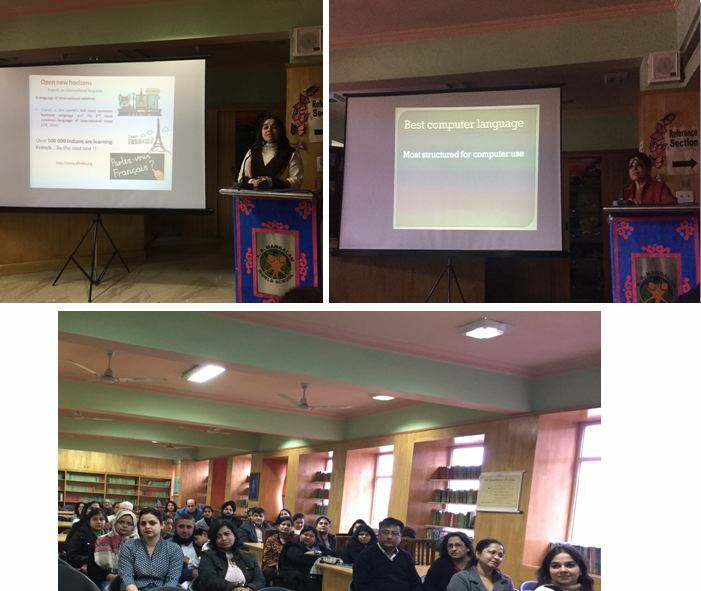 In pursuit of the same, an interactive session was held on 15th December 2017 for the parents of Class IV in order to help them explore the prospects of French, German, Sanskrit language and other firsthand information about their career prospects . Mr. Olivier Litvine, Attaché for Cooperation in French Language and Ms. Jagriti Bhudiraja, Coordinator, Educational Services, Goethe Institut/ Max Mueller Bhavan enlightened the parents about the benefits of learning French/German as a foreign language. Ms. Suman Sabharwal, the Sanskrit Faculty from K.R. Mangalam World School, G.K II, spoke about benefits of learning Sanskrit, the mother of all languages. The session helped the parents make a correct choice for the third language for their wards for Class V.
The session ended with an interactive discussion where the queries by the parents were taken up by the experts.